Skin Needling (also known as Collagen Induction Therapy or Dermarolling) is one of the most effective, least invasive skin tightening treatments available today that provides the shortest recovery time. 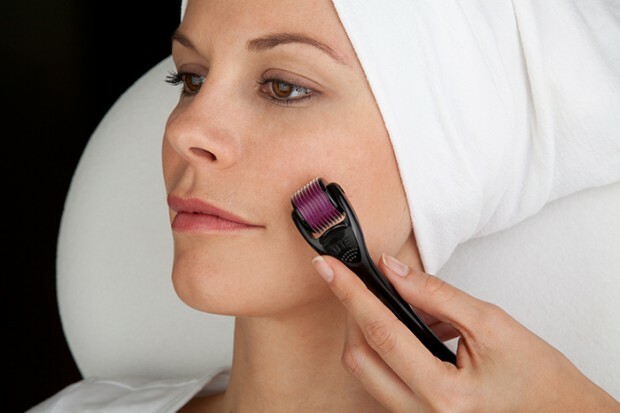 Micro needling promotes new skin growth through the science of Collagen Induction Therapy. It is the most effective way to stimulate new collagen safely and effectively without the use of lasers or ultrasound. Micro Needling reduces fine lines and wrinkles, minimizes pore size, diminishes acne scars and provides skin tightening. As we age our body naturally produces less elastin and collagen, causing laxity and wrinkles. micro skin needling reaches the dermis causing tiny micro-injuries, which in turn triggers the body to treat it as a high priority to fix them. These micro-injuries will trigger growth factors to repair and create new collagen. During the Micro Needling skin tightening treatment, the penetration and depth of the needles is adjustable, allowing for a customized treatment depending on the severity of your condition and your desired results. The first advantage is that this procedure does not permanently damage the skin. The skin will actually become thicker. The advantage of wrinkles being filled in by the collagen production triggered with needling is that the results are long-lasting compared to injected dermal fillers. After the initial treatment, patients often notice that their skin has a healthy pink glow and that fine lines are diminished. Skin naturally takes roughly four weeks to synthesize new collagen. Most patients notice a vast improvement in skin tightening, even after the first Medical Needling procedure. When Medical Needling and Home Care Needling are done in conjunction with skin care products containing growth factors; you will see a noticeable difference in the skin’s elasticity, texture and firmness.